This card — which I am taking the liberty of appropriating to send you with my best wishes — was painted for Christmas, 1893, by the artist Charles William Bauhan (ca. 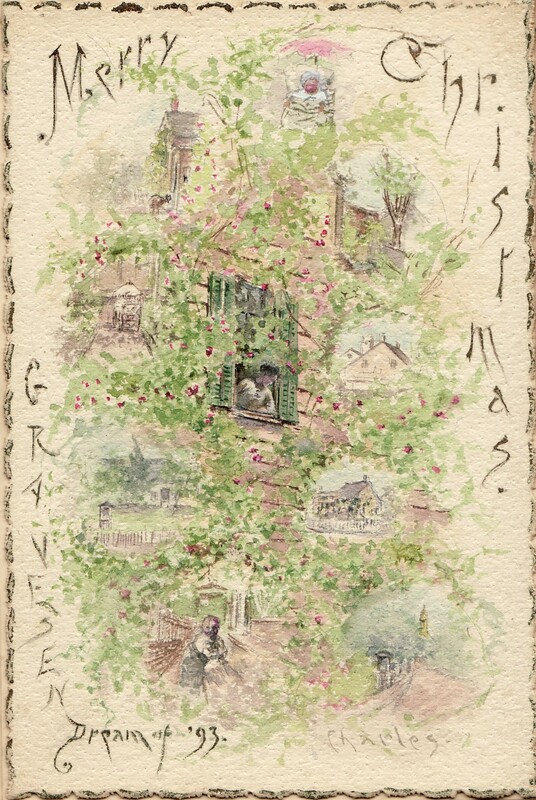 1861-1938), who was living then in Gravesend, hence the compound of “Gravesend” and “Dream” along the left side of the card: “GRAVESENDream of ’93.” The vignettes include a smaller version of his watercolor of Homer Wiltse tending his garden (upper left; the original is reproduced on the title page of Then & Now: Gravesend, Brooklyn); a side view of the Lady Moody House with the Reformed Dutch Church beyond (to the right of the woman leaning out of the window, who was probably his wife, Agda, also an artist); a view of the Wiltse House at 15-17 Gravesend Neck Road (below the previous image); and a view looking east on Neck Road to the Gravesend Town Hall (lower right). The toddler playing on the steps just above the ’93 (who is also depicted as an infant in his cradle between the words “Merry” and “Christmas”) was probably the artist’s son, the noted Princeton architect Rolf W. Bauhan (1892-1966).